We recently started talking about Taking Agile Back. I was surprised to hear how much response came from this. Now we have a community on google and presence on linked in and yahoo groups and twitter. People are coming from the woodwork to say that they're also sad about the state of agile practice and they either yearn to return to agile values, or they lament that they never were able to enjoy really practicing those values. I think that there are at least three immediate steps we can take. The first is a tad negative. We should call out the things that have grown on the skin of agile (shallow, peripheral issues) and have obscured the heart of the principles. I've already addressed some of the noise that has grown up around velocity and estimation. I've been suppressing a number of opinions on metrics and disengagement. You can love or hate Linked-In, but I have found kindred souls there, teaching and answering questions and calling out practices that divert from the real goals of creating a human system that actually produces all the time. I think it's always good to have some time spend in dialog on the forums there. There are google groups and yahoo groups where people ask good, honest questions, but they're often the wrong questions. It would be good to have people there to help scrape the barnacles from their view of the agile world. You don't have to publish in magazines or blogs or even twitter. Scrape the barnacles where you live, where your teams are producing software today. While we have issues with some distracting practices, please be aware that taking back agile is the work of many people. If you make us seem to be all anti-whatever, then we'll always be fighting to beat the image of being a bunch of haters trying to return to the past. More on this later. The first step to building the values is to live them intentionally. If you need reminders, visit the agile manifesto site and put a printout of the principles up on your own wall. Focus on being the most heartfully-agile person in your space. Then take to the streets. You probably have a blog or a twitter account. You probably go to user groups or company lunch-and-learn meetings. You could probably start some of these if you don't have them. What has worked really well in the past? How can we do these things much more intensely? As much as agile work has helped humanize the workplace, the practical advantages have always been the entree. One warning, though; don't try hard to seem an expert. Instead, be very transparent and open-hearted about your goal of becoming more expert all the time. Always be in transition, and never even pretend to have fully arrived. The humility of a seeker will win you much more mindshare than the appearance of authority. 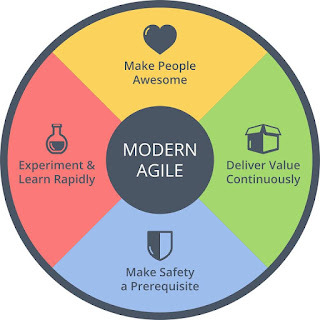 In this light, I'm planning to put together a positive blog this week describing how I have seen the agile methods pick up on rather old and new ideas and create greater project safety. I believe that agile methods are safer for developers, managers, customers, and all members of a product community. I'll tell why. I don't want to return to the technology of the 1990s or the 2000s. I don't want to be answering questions that people are not asking anymore. In the time between the manifesto and now, the world of technology has changed. We need to carry our values into the future and even modify them if we find them dated or unhelpful. Now we have influences from Lean Startup, cloud computing, mobile development, social computing, mob programming, etc. If we aren't moving forward, we become irrelevant. I believe that these values are timeless, in which case they work just as well in 2020 and 2030 as they did in 2010. Now we have something called Modern Agile which is free from barnacles, entirely built to promote four simple principles, and is moving forward. We finally have the forward-step I was hoping to see in 2014.